After a rich dinner on New Year's Eve of lobster ravioli in a lobster cream sauce, we decided to take things down a notch with a duck galantine. 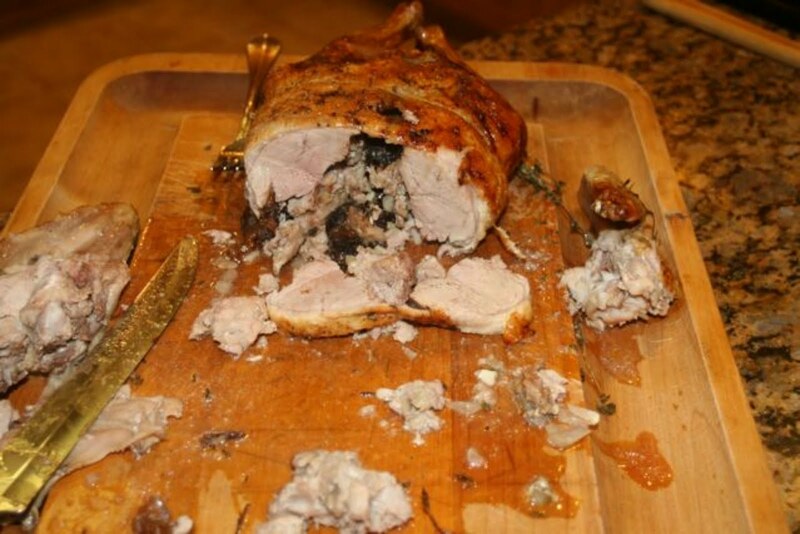 A galantine is when you use an animal's body as a vessel for stuffing with forcemeat. 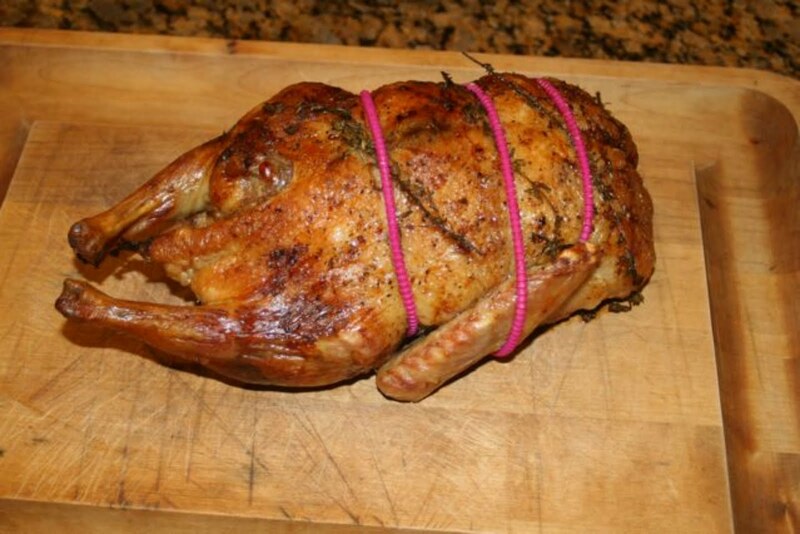 The most famous galantine is a turducken, the nigh-mythical beast of turkey-stuffed-with-duck -stuffed-with-chicken. 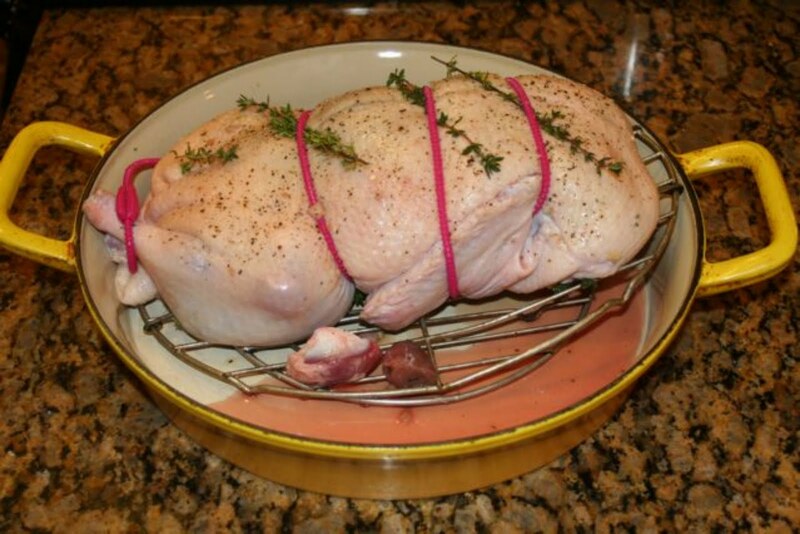 For this galantine I spit the skin of the duck down the back, then slowly worked my knife around the body carriage, being careful not to pierce the skin. The concept was to keep the skin in one giant sheet, with the breasts still attached, and then stuff and roll it all back up like a big sausage. The hardest part was cutting through the joints, where the wings and legs met the body. It's easy to apply too much force with the knife, which can cause the knife to slip and make an unwanted slit in the skin. I've boned out the bodies of chickens before, and while the low, sloped-shape of a duck was a bit harder than a chicken, the skin on a duck is much thicker and more resistant to accidental piercings with the knife. The forcemeat stuffing was a mixture of the leg and wing meat, chopped, then mixed with prunes soaked in madeira, sourdough bread, shallots, garlic, and thyme. Then roast as normal, which for me is 425 F for 30 min to get the duck fat running and the skin crisp, then down to 350 F. If I'm just cooking duck breasts, I'll do them medium, but for a whole duck I've never minded having the whole thing cooked through. It's a slightly stronger flavor than duck on the rare-side, but the duck has so much fat over the breast it doesn't taste dry. As you can see from the pictures, I could have added some eggs to help the forcemeat cohere a bit more. But the duck made up for the aesthetic issues with a great taste. The sweet flavor of the prunes and madeira acted as a contrasting foil for the rich, fatty duck. Plus I enjoyed playing with these silicon "butcher's twine" ropes my mom picked up. 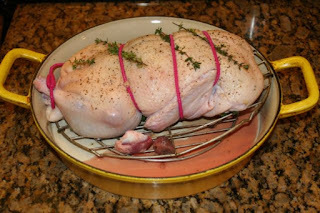 Although they don't have that rustic look (along with being hot pink), they're very easy to wrap a roast, wash, and reuse. But it's still hard for me to think of Richard Olney using them.